Modern dry cargo ship designs maximize hold space . A typical mid-size ship may have five or six holds; three or four forward of the machinery space and superstructure, and one or two aft. The machinery spaces and superstructure are usually located about threequarters aft. Older designs typically have three holds forward of the superstructure and two aft. Holds aft of the accommodation and machinery spaces improve the trim of the vessel when partially loaded, and provide the ship with sufficient draft aft for stability and propeller immersion. Small freighters often have machinery and accommodation spaces aft of all cargo holds. Deadweight of modern general cargo liners ranges from 9,000 to 25,000 tons; speeds range from 17 to 22 knots. Tramps are typically smaller and slower, with speeds ranging from 12 to 18 knots. The speed-to-length ratio is generally 0.87 or less as higher ratios are usually not economical. Laden drafts are as deep as channels to the intended terminal ports allow, typically in the 26- to 29-foot range. 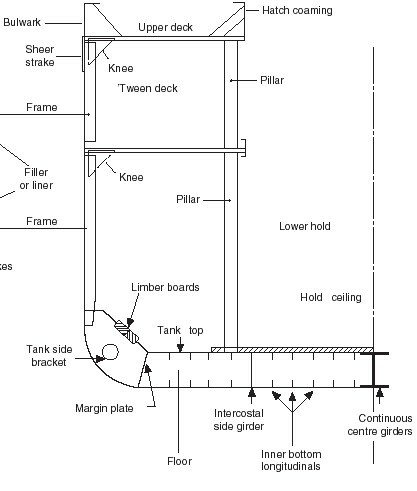 Hull depth is selected to provide the desired draft and satisfy statutory freeboard requirements. Depth of the double bottom is kept low to maximize cargo space. One or more ’tween decks may be fitted to facilitate flexibility in cargo loading and unloading, cargo segregation, and to improve stability. There may be watertight doors in the bulkheads on the ’tween decks levels. Denser cargoes are carried in the lower holds with high stowage factor products normally stowed in the ’tween decks. Refrigerated spaces may be built into the ’tween decks. Tramps are designed to carry a wide variety of commodities while liners may be designed for a specific trade. 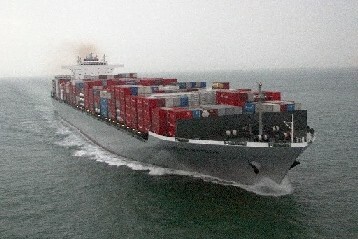 Ship designs for a specific trade strive for "full and down" operation; the ship’s freeboard is down to her loadline with cargo cubic fully occupied. For a given trade, hold spaces are usually designed so that the ratio of bale cubic to deadweight is 10 to 15 percent greater than the overall stowage factor of the goods carried to allow for more rapid cargo handling and broken stowage – the spaces between and around cargo units, including dunnage, and spaces not available for cargo stowage because of physical obstructions or ventilation and access requirements. Holds are sized and provided with cargo gear to limit the amount of cargo cubic per stevedore gang to about 60,000 cubic feet; holds in the midbody are therefore usually shorter than those nearer the ends of the ship. The conflict between the desire to shorten holds and the length required by cargo gear and hatches sometimes dictates the assignment of midships spaces to machinery or to fuel, cargo, or ballast deep tanks rather than holds. Hatches are as large as possible without compromising hull strength (the main or second deck is normally the strength deck) to reduce the requirement for horizontal movement of cargo within the holds. Hatches served by two sets of cargo gear generally measure 20 by 30 feet or larger. Hatches on older ships are generally smaller than those on newer ships. Hatches are surrounded by coamings to reduce the risk of flooding in heavy seas. Covers are usually constructed of steel (or wood on older vessels). The main deck plating between hatches is not effective in providing longitudinal strength, and is sized to carry fairly light local loads. The deck plating outboard the hatches is therefore much heavier, often exceeding five-eighths inch in thickness. Cargo gear is designed for speed and flexibility for handling breakbulk, palletized, or container cargo. Various combinations of derricks, winches, and deck cranes are used for the handling of cargo. Cranes are fitted on many vessels to reduce manpower requirements. Some ships have special heavy-lift derricks that may serve one or more holds. Booms are rigged for either yard and stay (burton) or swinging-boom operation. Various combinations of derricks, winches and deck cranes are used for the Handling of cargo. The term “general (multipurpose) cargo ships” covers many different ship designs that do not fit into other more specialised cargo ship types. Thus, general cargo ships are not specialised for transport of only dry bulks, only containers or only heavy-lift cargoes, but they have flexibility to carry any of these cargo types. 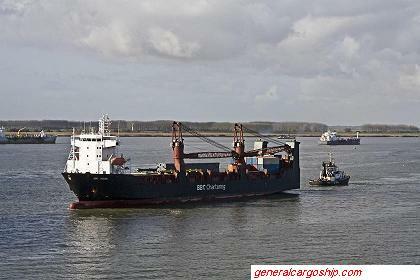 General cargo ships are the world’s most numerous ship types, excepting fishing vessels. Thus, in the year 2002 their share in the overall world merchant fleet amounted to about 37% in numbers and to about 11% in dwt. The average deadweight of the world fleet of general cargo ships is about 5600 dwt. Larger vessels, up to about 30000 dwt are intended to carry break-bulk cargo (bagged, boxed and palletised cargo) or containers, while small general cargo ships, usually below 5000 dwt are mostly found as flexible solutions for many dry-cargo types in shortsea shipping. The concern for structural safety of general cargo ships follows from the fact that during the period from 1995 to 2000 approximately 90 losses of these ships per year occurred, which in other words means one ship every 4 days, with 170 fatalities per year. Even 42% of losses of all merchant ships belong to general cargo ships and similar percentage is valid also for fatality experience. Despite these figures, general cargo ships are not considered in publicity as risky ships, probably because general cargo ship accidents are not as spectacular as for example accidents of oil tankers Erika or Prestige . There are several reasons for poor statistical records of general cargo ships. Ship ages, inappropriate maintenance, poor quality in operation of these ships and defi ciencies in design are some of the main causes of a large number of accidents. Smaller general cargo ships are particularly vulnerable to collision and grounding accidents because of their frequent operation in inland waterways and coastal waters. The general cargo ship consists of as large a clear open cargo-carrying space as possible, together with the facilities required for loading and unloading the cargo. Access to the cargo storage areas or holds is provided by openings in the deck called hatches. Hatches are made as large as strength considerations will allow to reduce horizontal movement of cargo within the ship. Hatch covers of wood or steel, as in most modern ships, are used to close the hatch openings when the ship is at sea. The hatch covers are made watertight and lie upon coamings around the hatch which are set some distance from the upper or weather deck to reduce the risk of flooding in heavy seas. One or more separate decks are fitted in the cargo holds and are known as tween decks. Greater flexibility in loading and unloading, together with cargo segregation and improved stability, are possible using the tween deck spaces. The economic factor is of prime importance in designing a merchant ship. An owner requires a ship which will give him the best possible returns for his initial investment and running costs. This means that the final design should be arrived at taking into account not only present economic considerations, but also those likely to develop within the life of the ship. With the aid of computers it is possible to make a study of a large number of varying design parameters and to arrive at a ship design which is not only technically feasible but, more importantly, is the most economically efficient. The initial design of a ship generally proceeds through three stages: concept; preliminary; and contract design. The process of initial design is often illustrated by the design spiral which indicates that given the objectives of the design, the designer works towards the best solution adjusting and balancing the interrelated parameters as he goes. A concept design should, from the objectives, provide sufficient information for a basic techno-economic assessment of the alternatives to be made. Economic criteria that may be derived for commercial ship designs and used to measure their profitability are net present value, discounted cash flow or required freight rate. Preliminary design refines and analyses the agreed concept design, fills out the arrangements and structure and aims at optimizing service performance. At this stage the builder should have sufficient information to tender. Contract design details the final arrangements and systems agreed with the owner and satisfies the building contract conditions. Total design is not complete at this stage, it has only just started, postcontract design entails in particular design for production where the structure, outfit and systems are planned in detail to achieve a cost and time effective building cycle. Production of the ship must also be given consideration in the earlier design stages, particularly where it places constraints on the design or can affect costs. The steel used in shipbuilding is mainly mild steel with 0.15-0.23% carbon content. Five grades of mild steel (A-E) are used ,manufactured, inspected, and tested under certain conditions. Finished steel is stamped by the classification societies. High tensile steel is developed to have higher toughness,ductility, weldability, and strength. This is developed by addition element such as vanadium, chromium, nickel, and Niobium. Aluminum use in shipbuilding has increased due to the lighter weight (1/3 weight of steel). This reduction of weight in the upper structure of the ship results in an improve of the ship stability. Aluminum has a good resistance to corrosion. The main disadvantage of Aluminum is the high cost. Aluminum section are formed by extrusion. A special insulating arrangement is used when joining steel to Aluminum. Loadlines are marks punched into and painted on the sides of general cargo ships.The assigning of the vessels loadline and the issue of the Certificate is the responsibility of the Marine Authority of the country. .
closely monitor the ship's condition during cargo operations to ensure that if a significant deviation from the agreed loading/unloading plan is detected all cargo and ballast operations must STOP.. Packing a container should always be done on level plane either on the ground,on a railcar, or on a trailer. In the case of a trailer, care should be taken to ensure the trailer cannot tip whilst being packed especially if a forklift truck is being used. If necessary the trailer should be propped. Brakes should be securely applied and wheels choked. Where relevant, stowing should be carried out in a sequence which will permit rapid checking and storage operations during and after unloading. Should the consignment include cargo subject to customs pre-entry procedures, customs examination would be made easier and unloading avoided if the cargo were stowed at the end of the container by the door. Containers have very little strength in any direction other than vertically through the corner posts thus it is necessary to provide substantial support to the containers when they are on the ship. Stowage of containers is with their longer dimension fore and aft since the ship motion transmitted to cargo is greater in rolling than pitching and it is therefore prudent to limit any possible cargo movement within the container to the shorter transverse dimension. Contain either curves of form or hydrostatic tables and stability and trim characteristics for various conditions of loading .